Endowments & Foundations are some of the most sophisticated and active investors in the business. To help you plan and better position yourself for the remainder of 2016 and beyond. We’ll present full results from our latest E&F survey including strategies of interest, disclose RFIs that are in the pipeline and get insight from John Pomeroy, CIO of Penn State. This webinar is exclusively available to subscribers of the RFI Service. 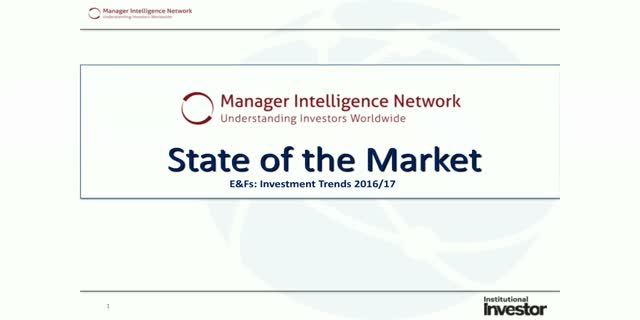 •RFI - who’s been winning E&F mandates, making the shortlist and why. •RFIs in the pipeline - E&Fs are excited about a resurgent EM and looking to allocate. •Avoid the middle ground, where E&Fs are allocating now and into 2017. •Public market pullback continues at pace, where are the pockets of opportunity? •Commodities/Energy, Private Credit/Direct Lending and PE on the up, is there still value? •Hedge Funds – risk reward most important to E&Fs…. incentive fee least important. •Why hybrid strategies, like Smart Beta, don’t appeal.